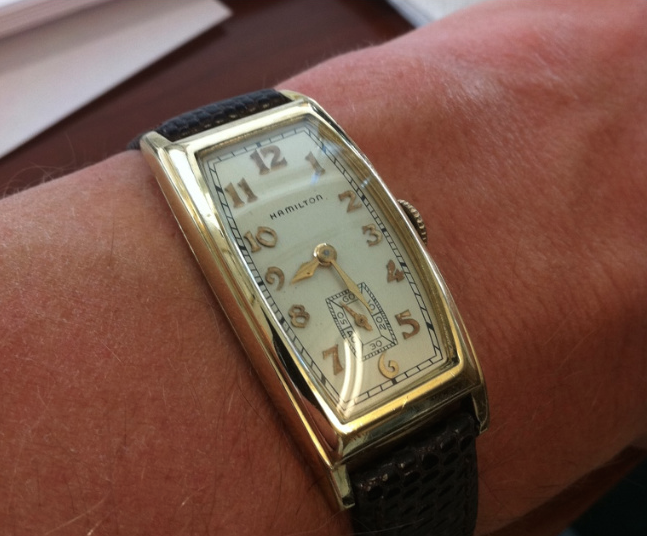 Part of Hamilton's curved-to-fit-the-wrist lineup, the 1937 Carlisle was produced for two years. It's a very long and slender watch and distinguishable from the similar period watches by the number 6 below the seconds register. Other models had gold dots, stars or no marker at all. The Carlisle features the 14/0, 17 jewel 980 movement in a 14K yellow gold filled case. 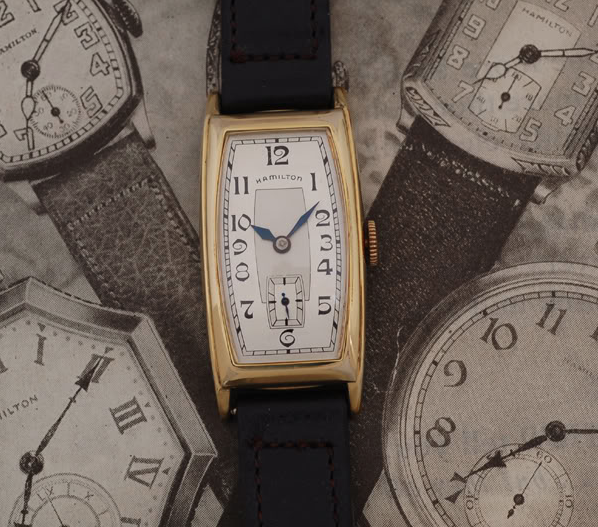 The model came with two dial options, solid gold applied numerals or an inlaid black enamel dial with matching black hands. Carlisles wear extensively on the front of the bezel, especially near the corners of the crystal. A nice thick crystal can help prevent additional gold loss. In addition, it's not uncommon to find wear through along the edges of the case reverse as well. I like the Carlisle and find it a comfortable watch to wear. I sometimes find it a little hard to tell the time on these ultra-elongated dials, especially as the hour hand approaches the corners of the watch (like 11:00). The black enamel dialed version is much harder to come by and would command a premium, even if the case wasn't in good shape - as that's easily changed. Here's a photo courtesy of Tom Diss.